May 2017…// St. Lucian sister resorts Jade Mountain and Anse Chastanet are pleased to reveal details of their fun, fruit-focused Month of Mango, happening this June. 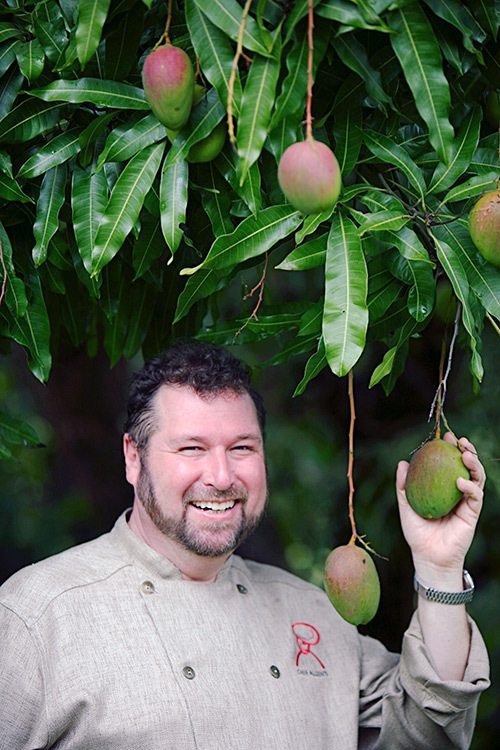 The resorts’ Chef Allen Susser, the author of The Great Mango Book, an authoritative mango cookbook, will lead this celebration of St. Lucia’s luscious tropical delicacy. Special events will include a “mad mango” cocktail party, cooking and chutney-making classes, a five-course mango-themed dinner, mango-themed spa treatments, estate tours and a mixology class devoted to rum drinks. The festivities will culminate with the six-day Mango Madness Festival from June 27 through July 2, featuring different daily culinary events. May 18, 2017…Who says wedding planning needs to be stressful? 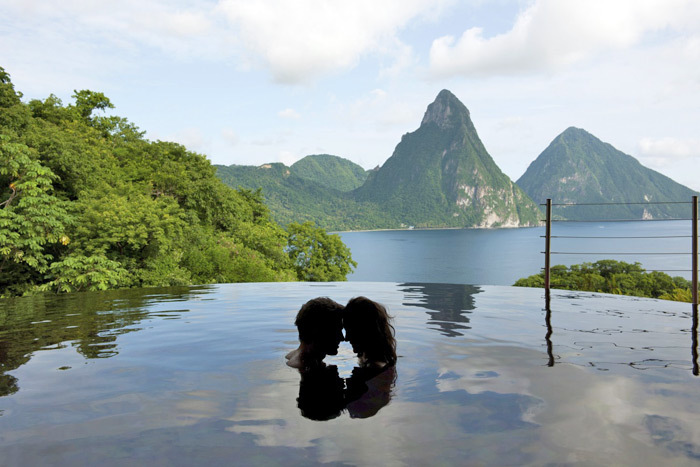 Whether they’re arriving secretly or bringing friends and family along for the celebration, St. Lucian sister resorts Anse Chastanet and Jade Mountain simplify the process for engaged couples, leaving them free to focus on what matters: The love they share and the excitement about getting married. Together, the resorts also offer a stunning hillside venue overlooking the Caribbean that is one of the world’s most distinctive luxury wedding locations. 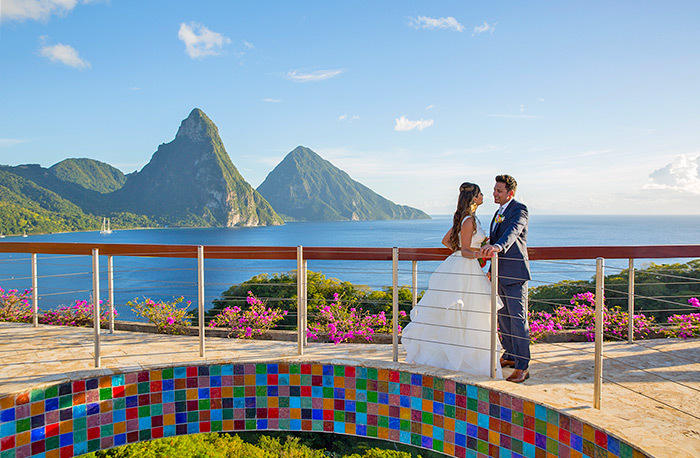 With incredible views of St. Lucia’s Piton World Heritage site and two protected crystal clear bays filled with coral reefs and tropical fish, it’s hard to imagine a more exquisite location to exchange vows. Beginning with a comprehensive planning consultation, a wedding at Anse Chastanet or Jade Mountain blossoms into a totally personalized event tailored to the bride and groom’s every whim. The talented staff, led by an expert destination wedding concierge who remains on-call for the entire process, will ensure that each wedding is both exclusive and unforgettable. The Ultimate Escape wedding package at Anse Chastanet and Jade Mountain is designed to create a hassle-free, all-inclusive wedding that is strictly tailored to meet the couple’s every need and desire for their big day. With only one to two days of residency in St. Lucia required for non-nationals to be married, the team at Jade Mountain and Anse Chastanet will organize necessary (yet crucial) details like legal documents, decorations and seating plans, ensuring that the bride and groom feel calm and carefree during the time leading up to their wedding day. Anse Chastanet is located on an idyllic spot on St. Lucia’s southwestern coast offering an incredible choice of wedding settings. There is no typical, cookie-cutter wedding chapel at the resort, so the couple is free to choose their very own special, private location to say “I do.” Anse Chastanet’s 600-acre tropical estate is home to an array of ceremony location options: A historic colonial-era estate, two white-sand beaches, and a dramatic waterfall nearby. The couple can also choose to marry in the privacy of their sanctuary suite. 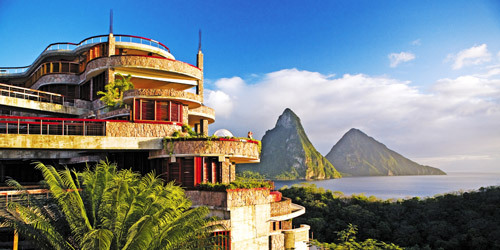 Jade Mountain is set high on the hills overlooking the glorious Piton Mountains. Upon arrival at the airport, the bride and groom may choose to transfer to the resort by helicopter, enabling them to better view the beautiful mountain landscape as well as the local rainforests. Once the couple arrives at Jade Mountain, they are greeted by a personal steward, called a major domo, and led to their sanctuary which awaits them at the end of an individual walkway. Jade Mountain’s spectacular setting and architecture is an unforgettable stage set perfectly for romance. The sanctuaries are grand, sweeping spaces where bedroom, living area and an extravagant private infinity pool meld together. Each sanctuary has a four-poster bed, inside and outside seating areas, double sinks and a two-person bathtub with customizable mood lighting, ideal for the newlyweds looking to enjoy a relaxing soak and glass of champagne. For guests arriving with any lingering stress, spending an hour floating in their private infinity pool at sunset, with softly flickering candles and a cocktail or two, will ensure that they’re totally relaxed before wedding prep begins. The Ultimate Escape wedding experience is available at Jade Mountain and Anse Chastanet year-round. The price includes decorations, a multi-tier wedding cake, photographer, videographer, private champagne sunset cruise, spa treatments for both bride and groom, live ceremony music, and embroidered bed linens on the night of the wedding. 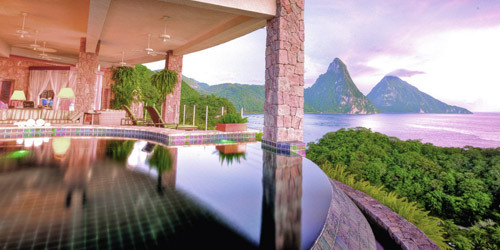 The Ultimate Escape Package at Jade Mountain or Anse Chastanet is priced at US $4,750 per couple. 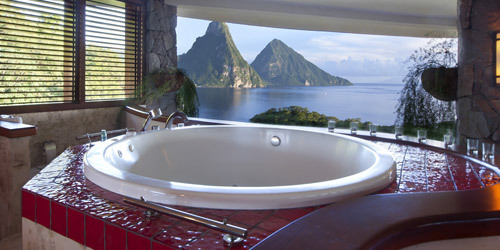 Nightly rates at Jade Mountain start at US$ 1,110 in a Sky Suite. Price is based on two persons sharing a Sky, Star, Moon, Sun or Galaxy sanctuary. All rates are subject to 8% tax and 10% service charges. Nightly rates at Anse Chastanet start from US $390 per night in a Standard Room based on two people sharing. There are free night promotions available at both properties offering up to 2 nights free this summer. Guests traveling in August or September 2017 will also be eligible for a free basic wedding package, details can be found on the resort websites. 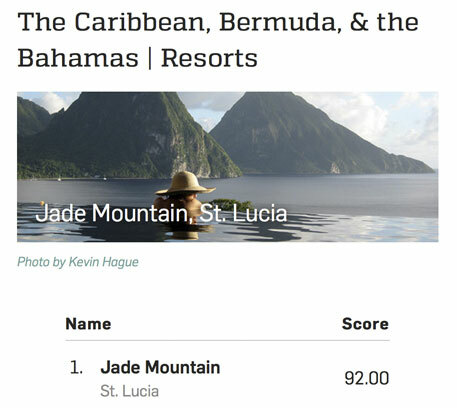 February 9, 2017—Jade Mountain Club and Anse Chastanet have earned three Readers' Choice awards from 10Best, one of USA Today's travel web sites. 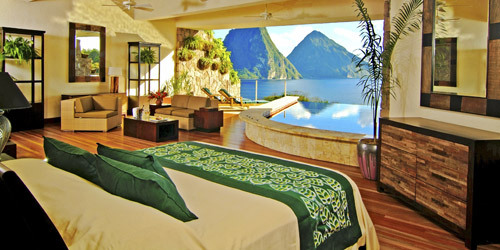 Jade Mountain was voted "Best Caribbean Resort" and Anse Chastanet was voted "Best Caribbean Beach." 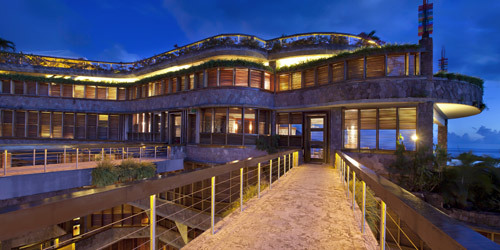 Jade Mountain Club restaurant was also named one of the Top 10 Caribbean Restaurants. The two hotels were the only St. Lucian properties to win 10Best awards. “We are absolutely thrilled to earn these honors from 10Best and USA Today, and to be in company with some of the most prestigious resorts in the Caribbean,” said Karolin Troubetzkoy, owner and marketing director of Jade Mountain and Anse Chastanet. Set on St. Lucia's southwestern coast, Anse Chastanet and Jade Mountain share a lush, scenic 600-acre estate overlooking the Gros and Petit Pitons, 2,500-foot twin volcanoes that are a UNESCO World Heritage Site and have come to represent the island itself. Jade Mountain, which was singled out as the best hotel in the entire Caribbean region, is the intimate and luxurious resort at the upper half of the estate. 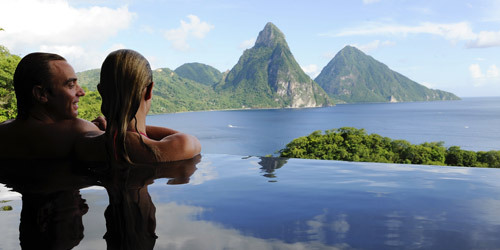 The hotel is architect and founder Nick Troubetzkoy's fitting tribute to St. Lucia’s dazzling beauty. It's known for its incredible panoramas, generously sized infinity pools and details like carefully handcrafted furnishings sourced from local materials. Troubetzkoy's uncompromising architectural vision also helped bring to life details like dramatically suspended bridge walkways (instead of hallways) and open layout within the rooms. Each suite, called a "sanctuary," is missing a fourth wall to better show off the spectacular Piton and sea views. Perched high above the sanctuaries is the acclaimed Jade Mountain Club restaurant, a perfect place to watch the sunset. "Wrapped around an infinity pool overlooking the natural grandeur of St. Lucia, the Jade Mountain Club serves seasonal, modern fusion cuisine highlighting the tropical flavors of the Caribbean," says 10Best. The cuisine is overseen by the highly acclaimed chef Allen Susser, who has won the James Beard Foundation's Best Southeast Chef award. Menu highlights include kingfish ceviche, giant prawns, Chateaubriand steak and artisanal chocolate made from locally grown cacao beans. At the lower part of the property, two beaches are set on crystal-clear bays that are part of a reserve protecting an expansive coral reef teeming with tropical fish. Anse Chastanet, which 10Best readers selected as the Best Caribbean Beach, is directly in front of the resort. As 10Best says, "Those lucky enough to be sprawled out on the sands ... enjoy stellar views of the Piton Mountains and snorkeling just 10 yards from the beach." Both Jade Mountain and Anse Chastanet have received numerous accolades such as placement on Travel + Leisure's T+L 500 and World's Best Awards lists, the Conde Nast Traveler's Gold List and Readers' Choice Awards, American Express Travel's Top 25 List and BRIDES magazine's round-up, “The 10 Best Honeymoon Resorts in the Caribbean.” Most recently, Jade Mountain was included in the National Geographic Society's new full-color book, The World's Most Romantic Destinations, as the recommended hotel for St. Lucia. 10Best.com, acquired by USA Today in 2013, provides users with original, unbiased, and experiential travel content of top attractions, things to see and do, and restaurants for top destinations in the U.S. and around the world. The core of the site's uniqueness is its team of local travel experts: a well-traveled and well-educated group who are not only experts in their fields—and their cities—but discriminating in their tastes. These local experts live in the city they write about so the content is constantly updated. 10Best.com averages 5 million visitors per month. The history of chocolate in Saint Lucia dates as far back as the 1700s when cocoa plantations flourished in the area. And it's no wonder the crops fare exceeding well here; Saint Lucia benefits from a tropical, humid climate moderated by northeast trade winds that allow for enjoyable conditions year-round. The average temperature is 78.8 °F (26°C) at sea level. Today, many local chefs and resorts are revitalizing this once thriving industry by offering multi-sensory chocolate experiences to guests; in doing so, they are fostering the growth of talented people and strengthening the heritage of chocolate growers. Jade Mountain Resort Saint Lucia Celebrates "Timeless Treasure of Love"
Saint Lucia, February 2016 — At Jade Mountain, eternal romance rules. The "The Timeless Treasure of Love” promotion is geared towards couples married 20 years and more and staying at Jade Mountain for a minimum of 4 nights. Couples will be able to take advantage of special complimentary anniversary amenities including a couple’s massage, a complimentary renewal of vows ceremony followed by a private dinner set up at a location of choice and a special session with the resort photographer. ‘‘The Timeless Treasure of Love ‘‘ promotion is available in selected suite categories for travel March 15- Dec 19, 2016. The promotion must be booked no later than April 30, 2016. "The Timeless Treasure of Love” offer is combinable with other promotions such as the “Take 5” 5th night free offer but restrictions may apply. To be eligible, "The Timeless Treasure of Love” must be pre booked and a copy of the wedding certificate is required at check-in. Rising majestically above the 600 acre beach front estate of ANSE CHASTANET, JADE MOUNTAIN is a cornucopia of organic architecture celebrating Saint Lucia’s stunning scenic beauty. Each of the 24 infinity pool sanctuaries at Jade Mountain is a carefully designed, individual work of art and design. With the 4th wall entirely open, all sanctuaries celebrate unparalleled views of the Pitons and the Caribbean Sea while at the same time allowing for complete privacy. Expect grand sweeping spaces where bedroom, living area and the extravagant private infinity pool glide into one another to form extraordinary platforms floating out into nature. With his Jade Mountain, architect owner Nick Troubetzkoy has created a stage-like setting from which to embrace the full glory of St. Lucia's World Heritage Pitons Mountains and the Caribbean Sea – a view you are not likely to ever forget. “What I’ve really wanted to do with Jade Mountain is reevaluate and redesign the basic concept of a holiday hotel experience. I wanted to create individualized spatial environments that would enable guests to forget about the furniture or the fact that they’re in a hotel room – in essence, to forget about everything but experiencing the psychology of the space on an emotional, almost spiritual level”, explains Troubetzkoy. Integral to the sanctuaries is the Jade Mountain Club where guests can enjoy a romantic meal, savoring “Jade Cuisine”, the creation of consulting chef, James Beard Award winner Allen Susser. Fresh produce gets delivered daily from the resort’s organic farm Emerald’s. No meal is complete without sampling one of the resort’s chocolate concoctions with chocolate made from their own beans and in their own chocolate laboratory. Hovering in space above the Jade Mountain Club is the Celestial Terrace, ideal for star gazing, a private dinner and a popular location for a vow renewal. Jade Mountain guests enjoy privileges at sister resort Anse Chastanet with its two beaches, additional restaurants, bars and a great range of soft adventure activities, from scuba diving to jungle biking. The beaches and the historical plantation of Anse Mamin offer additional options for couples seeking a special location for their celebratory dinner or vow renewal. This is what the readers are saying! "It's unlike any place in the world—you have to stay here to appreciate the brilliant design." "You will come home changed"
"No matter who you are or where you've been, this place will enchant and amaze you." "Jaw-droppingly beautiful rooms" all have 15-foot ceilings, "unforgettable Piton Mountain views," and private infinity pools in different colored tiles (ruby, amber, and plum). Chef Allen Susser's Jade Mountain Club mixes sweet and spicy flavors, but the emphasis is on "seafood that makes your taste buds sing." Jade Mountain has been personally conceived and built by architect, owner Nick Troubetzkoy. He started his love affair with Saint Lucia more than 30 years ago with the opening of Jade Mountain’s sister property, the popular Anse Chastanet – itself a Reader Choice Award Winner. He then unleashed all of his creative passions in the design of Jade Mountain, which opened in early 2007: a bold architectural statement perched on a mountain top overlooking Saint Lucia’s landmark, the spectacular twin Pitons, a UNESCO World Heritage site. Individual bridges lead to the resort’s stunning open-walled guest sanctuaries which are grand sweeping spaces, where bedroom, living room and an extravagantly sized private infinity pool form extraordinary platforms which appear to float out into nature. With the fourth wall entirely absent, Jade Mountain’s sanctuaries are stage-like settings from which to embrace the full glory of Saint Lucia’s Pitons and the Caribbean Sea. Wrapped around an infinity pool with a dazzling kaleidoscope of colors, the Jade Mountain Club restaurant caters exclusively to resident guests, celebrating James Beard Award-winning Chef Allen Susser. The development of the resort’s organic farm, Emerald Estate providing fresh produce for the resort kitchens, yearly food festivals, inter-active cooking classes and the making of their own chocolate from tree to bar has brought yet another dimension to their “Jade Cuisine”. 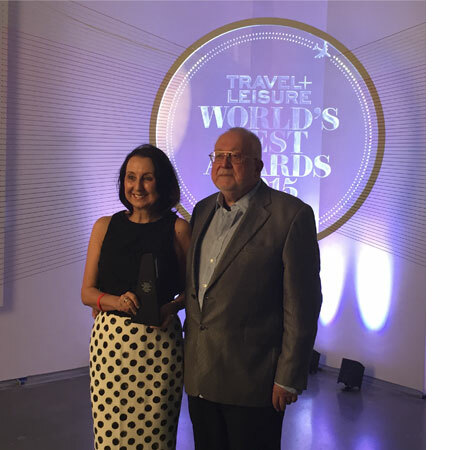 This prestigious award follow Jade Mountain’s top spot placement in the recent Travel + Leisure’s World’s Best Awards 2015. 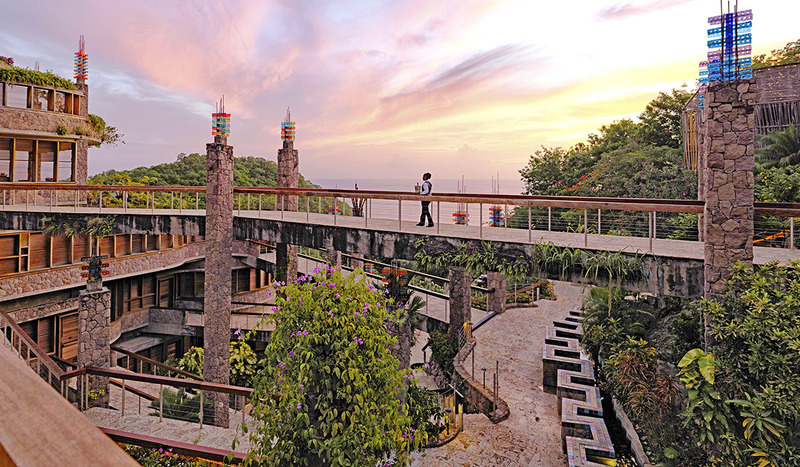 This is an extraordinary tribute to Jade Mountain’s staff and owner’s philosophy of excellence. Daily rates per couple run from US 1050 to US 3250 for travel this fall and winter. NEW YORK (July 28, 2015) - Nick and Karolin Troubetzkoy, owners of the storied Jade Mountain resort in St. Lucia, are seen here in Manhattan receiving their Travel + Leisure award recognizing their stunning resort as the best hotel in the Caribbean. Jade Mountain's recognition by Travel + Leisure's World's Best Awards 2015 is the fourth time, and the third consecutive year, readers of the distinguished travel magazine have cast top votes for St. Lucia's leading luxury resort. The awards reception took place in New York on Thursday, July 23. 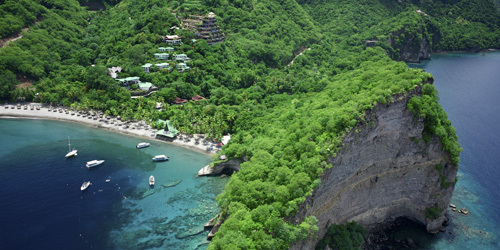 For more information, visit www.jademountain.com. Jade Mountain, Saint Lucia named one of the World’s Top 100 Hotels and the Caribbean’s No 1 Resort in Travel + Leisure’s World’s Best Awards 2015, for the 4th time and 3rd year in a row! 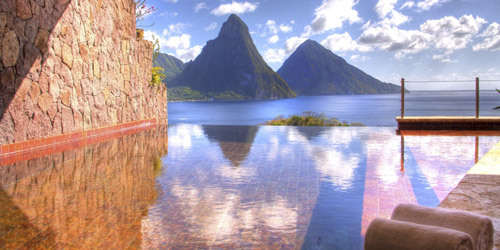 New York, NY, July 7, 2015: Travel + Leisure Magazine announced today that Saint Lucia’s Jade Mountain has once again been named one of the Top 100 Hotels in the World and Number One in the Caribbean in the latest Travel + Leisure World’s Best Awards 2015. 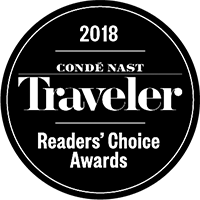 For the 4th time and 3rd year in a row Travel + Leisure’s readers have cast their votes for Saint Lucia’s Jade Mountain as the Number 1 Caribbean Resort that defines the very best in travel. Much of Jade Mountain's success can be attributed to the ongoing direct involvement of owners Nick and Karolin Troubetzkoy in their daily operations and the passion and limitless enthusiasm they have been able to instill in their resort team. Their guest service team is led by the resort major–domo butlers who are assigned to each guest and who look after their resort experience around the clock from arrival to departure. 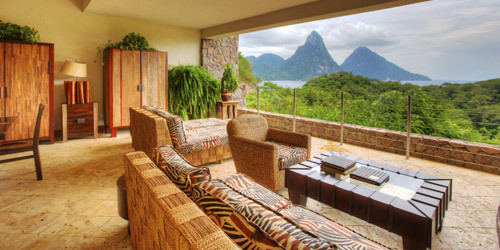 “Walk into the living room and it seems as if you’ve walked into the Pitons: suites have only three walls, offering open-air, panoramic views,” writes Travel + Leisure. “Designed and owned by Russian-Canadian architect Nick Troubetzkoy, the resort has bold and organic architecture that celebrates the natural beauty of St. Lucia." Nick Troubetzkoy, the resort chairman, architect and builder started his love affair with Saint Lucia and the Caribbean with the opening of Jade Mountain’s sister property, Anse Chastanet in the 70’s. His revolutionary architectural approach produced the bold and completely unique Jade Mountain which opened in early 2007 and is perched on a mountain top overlooking Saint Lucia’s landmark, the spectacular twin Pitons, a UNESCO World Heritage site, surrounded by the Caribbean Sea. There are 29 suites in total, which are called sanctuaries. In 24 of the sanctuaries, an extravagantly sized private infinity pool seems to be floating out into nature. Jade Mountain also runs an organic farm and there is an on site chocolate laboratory making chocolate from their own estate grown cocoa trees. Guests have privileges at the adjoining sister resort Anse Chastanet with 2 beaches, additional restaurants and excellent resort activities including jungle biking, scuba diving, hiking and bird watching. The results of the Travel + Leisure World’s Best Awards 2015 are featured on Travel + Leisure and also, in the August issue of Travel + Leisure, on newsstands July 18. Jade Mountain is open year round. Rates this summer start at US 1,050 per couple nightly in a sky category sanctuary, subject to 10% service charge and 10% VAT. A 4th and 7th night free promotion is available in selected categories and the resort also offers all-inclusive options. Visit http://www.jademountainstlucia.com/promotions.html for all promotions. ABOUT JADE MOUNTAIN RESORT Award-winning Jade Mountain resort soars majestically above an exclusive 600-acre beachfront estate. Jade is an architectural marvel that embraces and celebrates St. Lucia's stunning scenic beauty – the view from your suite is a UNESCO World Heritage Site. Individual bridges lead to the resort’s stunning open-walled guest sanctuaries. In each of the 24 sanctuaries, bedroom, living area and an extravagant private infinity pool glide into one another to form extraordinary platforms floating out into nature. With the fourth wall entirely absent, Jade Mountain’s sanctuaries are stage-like settings from which to embrace Saint Lucia’s scenic splendor. SOUFRIERE, St. Lucia (April 21, 2015) - Jade Mountain and Anse Chastanet resorts are marking Earth Day, Wednesday, April 22, by switching their lighting systems to an energy efficient, ecologically friendly light-emitting diode (LED) solution. Karolin Troubetzkoy, who manages operations at the award-winning St. Lucian resorts, said: "We have registered an initiative withEarthDay.org, stating our commitment to change from incandescent to LED lighting." Carl Hunter, property manager for the world renowned resorts, asserted that the switch to power-saving LED lights will reduce electricity consumption on site from a total lighting load of 120,000 watts to 15,000 watts, a reduction of 87.5 percent of the property's lighting load. This represents a monthly reduction of 37,400 kWh. Furthermore, he added: "The switch to LED bulbs will significantly reduce our carbon footprint and the resorts' dependence on the burning of expensive fossil fuels to generate energy." As to cost savings, he asserted they were significant. A minimum savings of $4,140 per month is expected over a lamp's lifecycle of 50,000 hours or 22 years. The investment of approximately US$21,000 will achieve simple payback on energy savings over five months. The Earth Day Network's year-round mission is to broaden, diversify and activate the environmental movement worldwide, through a combination of education, public policy, and consumer campaigns. Anse Chastanet and Jade Mountain take pride in sharing their commitment to environmental stewardship with resort visitors. "We give our guests information about the culture, history, and ecology of the local region, including local environmental protection efforts and social and cultural activities," said Troubetzkoy.